BIKES, SCOOTERS AND MUCH MORE! Engadine Cycles and Scooters in Sydney's Sutherland Shire have bikes and scooters to suit all ages and all budgets. Every bike that we sell comes with a FREE check in the first month that you own it and we will carry out a FREE FULL BICYCLE SERVICE in the first 3 months. Our southern Sydney bike shop stocks all of the leading brands including Mongoose, GT, Schwinn Bicycles, Verde, Kink, Fuji, Fit Bike Co, Stolen, Colony, Mirraco, Wethepeople, Radio, Jamis and Apollo. 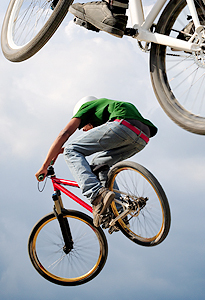 We carry one of the largest range of BMX bikes in all of Sydney and the largest BMX range in the Wollongong, Illawarra region. We also carry a huge range of kids bikes including the full range of Mongoose kids bikes. Engadine Cycles and Scooters have been selling bicycles and scooters in the Sutherland Shire for 30 years and have many loyal Bike and Scooter customers across Sydney, Helensburgh, the Illawarra and throughout Australia through our online store. We have now started taking laybys for Christmas. Get in early and pay off your lay-by over time. Worried that the bike that you want to buy as a present will be sold out by Christmas? Here at Engadine Cycles and Scooters we can offer you a layby service on that perfect bike or scooter. 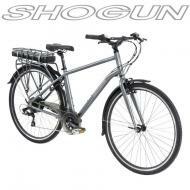 We accept all major credit cards in our Sutherland Shire bike store and accept paypal on our online shop. We carry an extensive range of mountain, kids, racing and leisure bikes including the largest range of BMX bicycles in the Sutherland Shire. 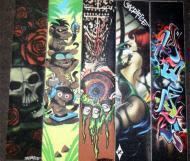 We also have a huge range of sizes. If you come into our bike store in the Sutherland Shire we can help fit you with the perfect bicycle for your size shape and budget. If you can't find what you are after in our store or our online shop then ask and we quite likely will be able to order it in for you. In Sydney scooter store we have over 100 scooters on display. With over 1500 items our Engadine Scooter shop has Australia's largest listing of Freestyle Scooters, Kick Scooters, Scooter Parts, and Scooter Accessories and the largest display of freestyle scooters in the Sydney, Sutherland Shire area. We are Australia's original Scooter store and have been involved with Razor and MGP scooters since their inception. 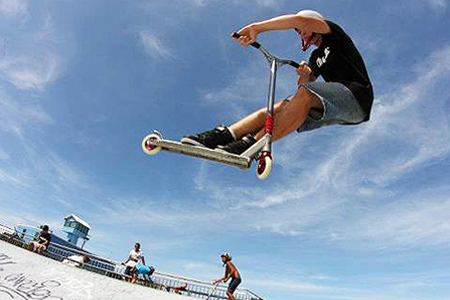 The first prototype kick scooter arrived in Australia in late 1998 with the first retail stock in 1999. We have the largest range of scooter wheels, accessories and grips available in Australia plus Envy Scooters, Prodigy Scooters, Crisp Scooters, Sacrifice Scooters, Proline Scooters, Triad Scooters, Grit Scooters, District Scooters, Ride 858, Ethic Scooters, Addict Scooters, Root Industries SE Lithium Scooters & Invictus Complete, Apex Scooters, Globber Scooters, Mongoose Scooters along with many custom scooters. 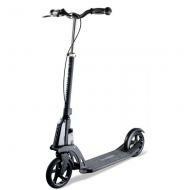 We also have the largest range of adult kick scooters in Sydney and Australia. 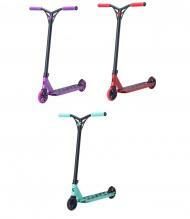 Grit Scooters girls scooter range is now here. 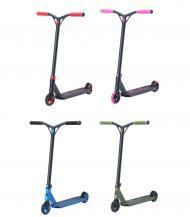 The new Grit Vibes Scooters. 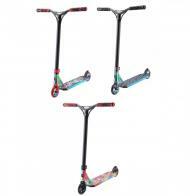 We also have the largest and cheapest range of kids mini kids three wheels scooters in Sydney with the full range of Globber scooters at the cheapest prices in Australia. 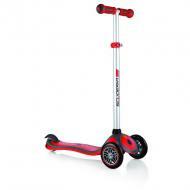 The 2018 Globber range is here along with the extremely popular Globber Evo Comfort 5 in 1 Scooter and the Globber Primo Plus Kids 3 wheel scooter. If you need to get your precious scooter or bike repaired anywhere in the Sutherland Shire we are the guys to call, our bike mechanics are some of the most experienced in they Sydney Region.. We have a huge stock of parts available in our shop and if we haven't got the part you need we will order it in for you. Ring our Engadine store in Sydney's south to book in your bicycle or scooter for a service or repair. We pride ourselves on being the fastest and cheapest bicycle repair, service store in the Sutherland Shire with all our work covered by our Customer Satisfaction Guarantee. Engadine Cycles and Scooters carry a full range of standards approved bicycle helmets in our shop. 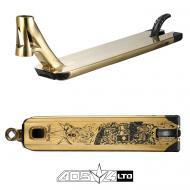 We also stock an extensive range of bicycle and scooter accessories. Come into our Sutherland Shire Sydney store and check out the variety or alternatively you can shop online using our online store. Make sure that you check out our Bicycle and Scooter Safety page for more information on helmets. In our Engadine, Sutherland Shire store we carry the complete range of Pro Gear and Buzz Racks and Accessories for cars, as well as Allan racks and the complete range of Pacific racks. Also, if you can't find what you want in our online shop give us a call and we might be able to order it in for you. Don't forget to take a look at our Bicycle and Scooter Safety page for rules and guidelines on carrying a bicycle on a motor vehicle.